Taylor Travaglione personifies the new class of modern real estate professional by providing substantive knowledge about all aspects of real estate and full-fledged, elegant, and discreet service to sellers, developers, and buyers of residential & commercial property with over a decade of experience. 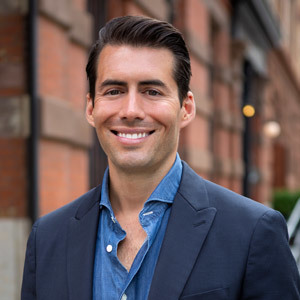 Taylor's broad knowledge of the luxury market, consumer and design trends, the properties, and the many criteria involved in the sale or purchase of a property, provides his clients and customers with a service unparalleled in the industry. As a seller's broker, Taylor provides a marketing service that is both unique and effective, combining refined selling skills with marketing methods that fully embrace the digital age, enhancing the exposure of the property, and thereby maximizing price. His negotiating skills, while not intimidating, have produced the results that his clients expect. His clientele ranges from first-time sellers to seasoned multiple-dwelling owners of multi-million dollar homes. As a buyer's broker, Taylor's keen eye, listening skills, and attention to detail have kept his customers unquestionably loyal. With eternal patience, he identifies his customers’ specific needs to match them to the best possible property, often identifying opportunities that others were unable to see. His services extend beyond the expected; his level of taste and his understanding of architecture and interior design, along with a broad knowledge of resources, have helped buyers realize their dreams.